Amusing and colourful everyday scenes with pictures from each scene labelled with Japanese words with pronunciation guides and translations. 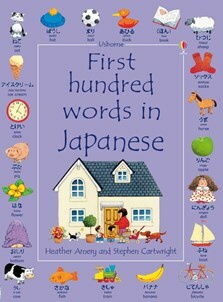 Includes an alphabetical English/Japanese word list with easy-to-use pronunciation guide. Delightfully illustrated by Stephen Cartwright, with a yellow duck to find on each double page. Listen to all the words read by a native Japanese speaker at the Usborne Quicklinks Website.